He also wrote at least one song with his band Pink7 before joining Chengtian Entertainment. None of those songs have been released. 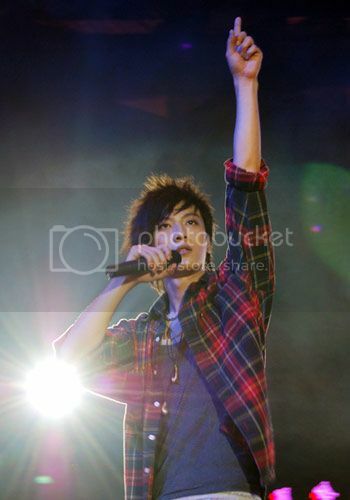 He also had a succssful concert in 2008 in Shanghai. For more pics and info go here. Edited by cfensi, 09 August 2009 - 07:39 PM. So it seems aside from being in Prince of Tennis 2 Kimi will be in a Wallace period drama this year as well. Yeah, he's not going to be in it very much though. Sort of like how he doesn't say too much in One Night in Supermarket. So far Chengtian doesn't put him as the leads because he's still a beginner. They're all sort of character roles that will help him with his acting, but not ones that the series depends on. Btw...redid his page. And Li Yifeng's and Zhang Junning's and Wei Chen's. Edited by cfensi, 08 August 2009 - 10:09 PM. Yay, my photobucket bandwidth came back. Kimi went on Happy Camp! This should mean an album release around the corner. Edited by cfensi, 23 September 2009 - 10:41 PM. Kimi and company-sister Tang Yan self-cams from their trip to HK to film their USB commercial.